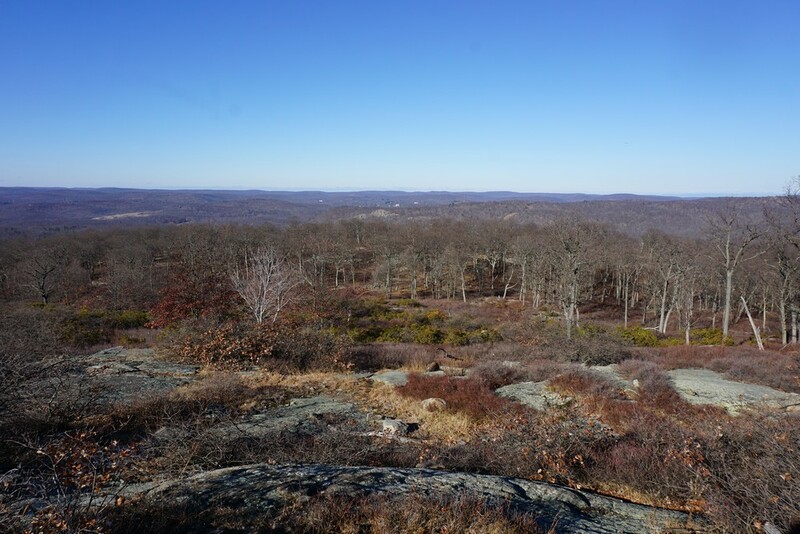 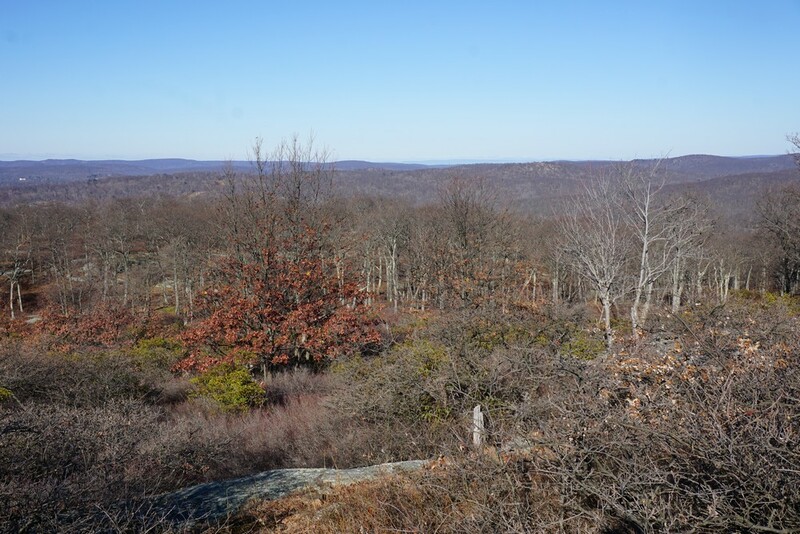 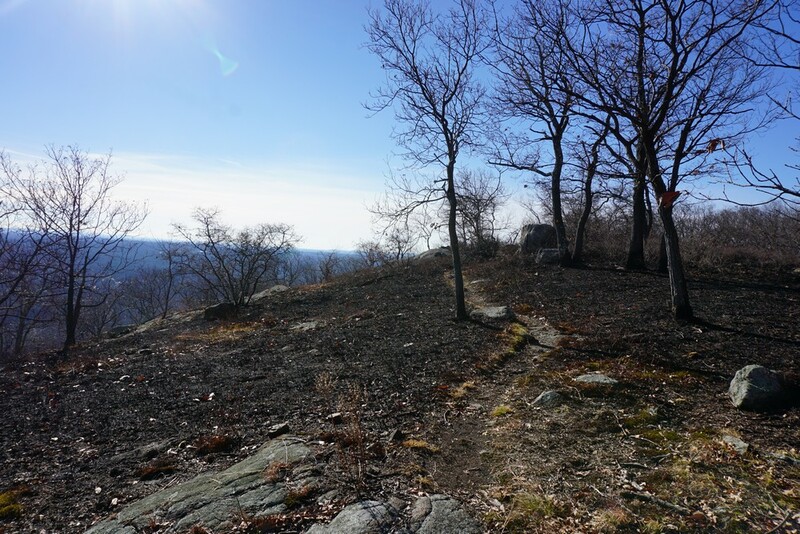 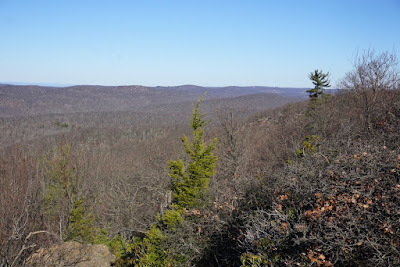 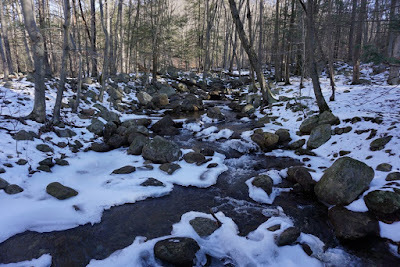 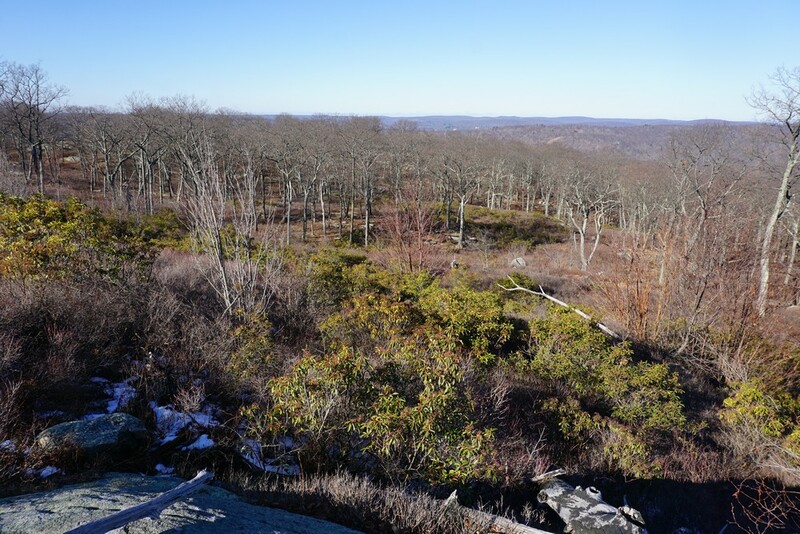 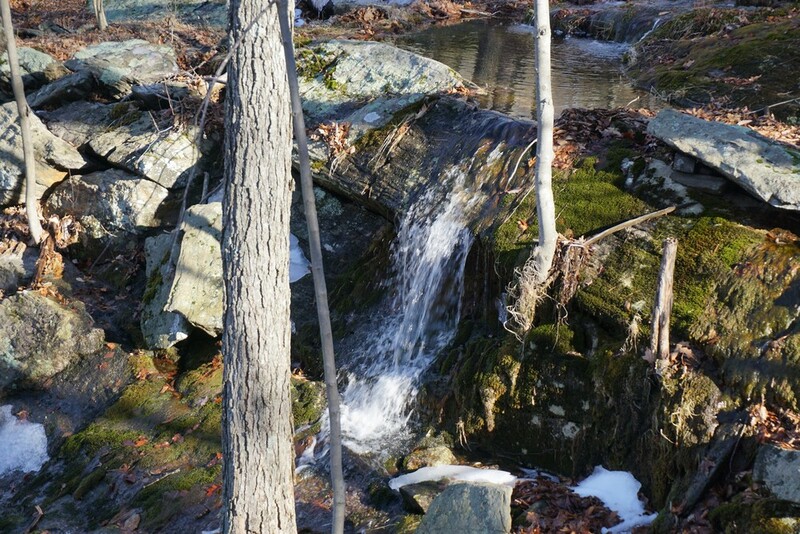 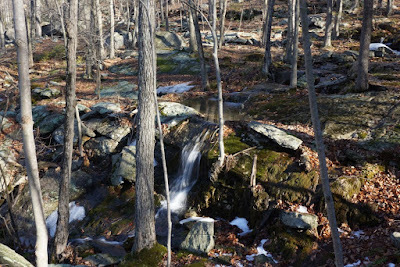 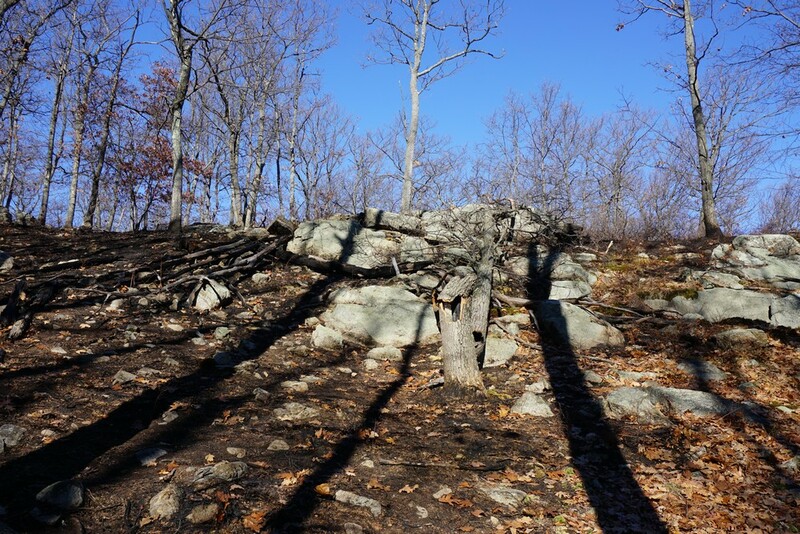 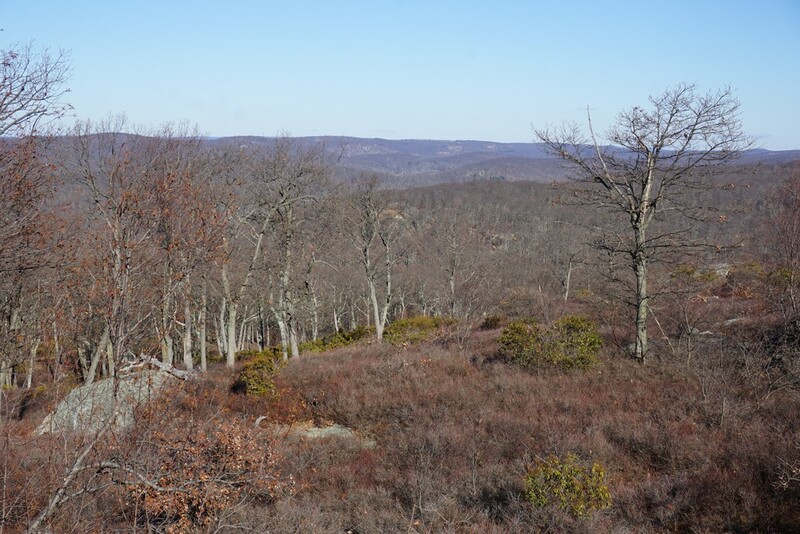 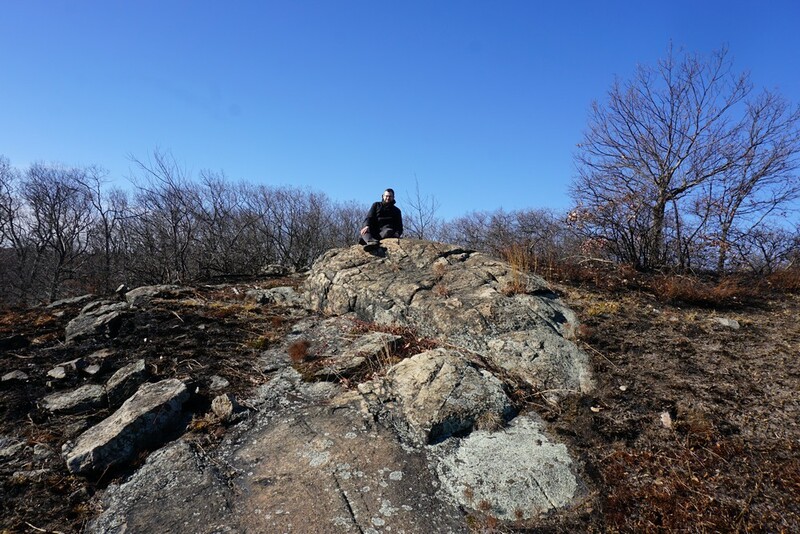 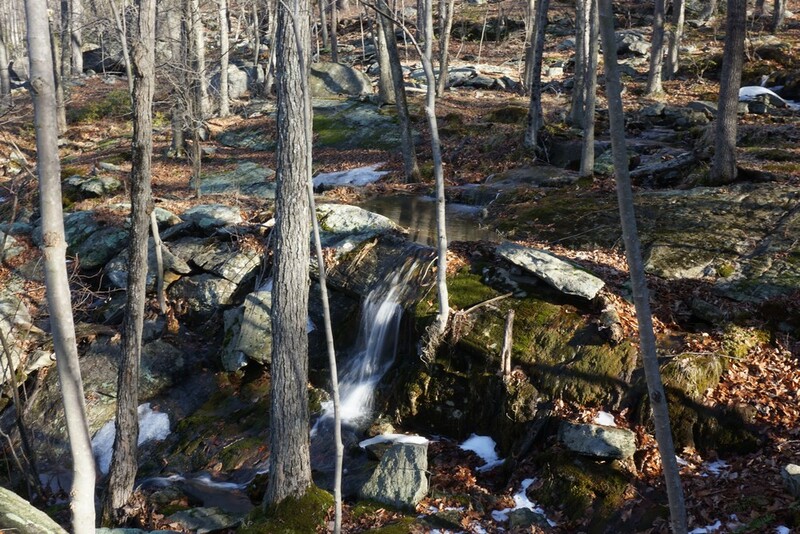 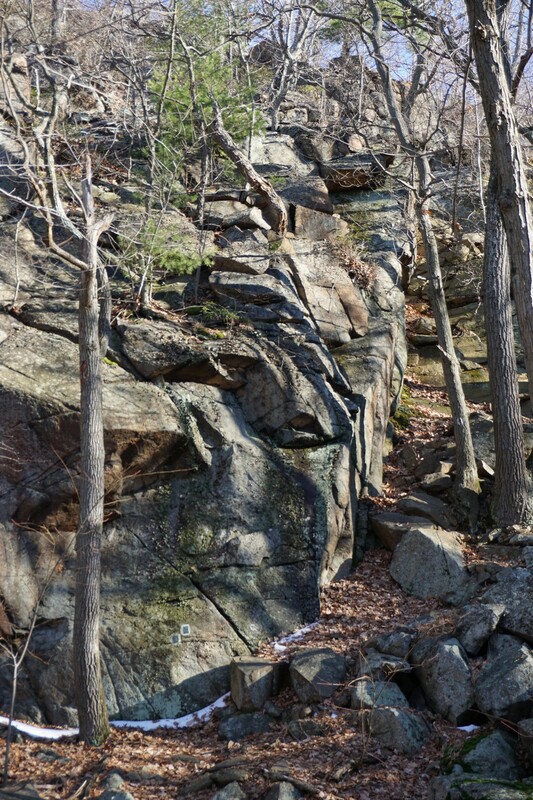 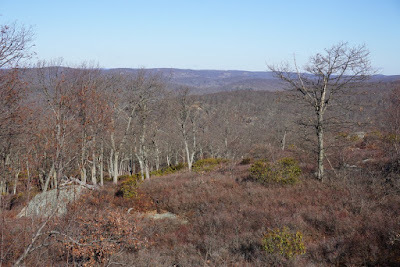 Overall this is one of my favorite hikes in Harriman. I had not been to this area in a while, and wanted to stay more local while still doing a great hike. 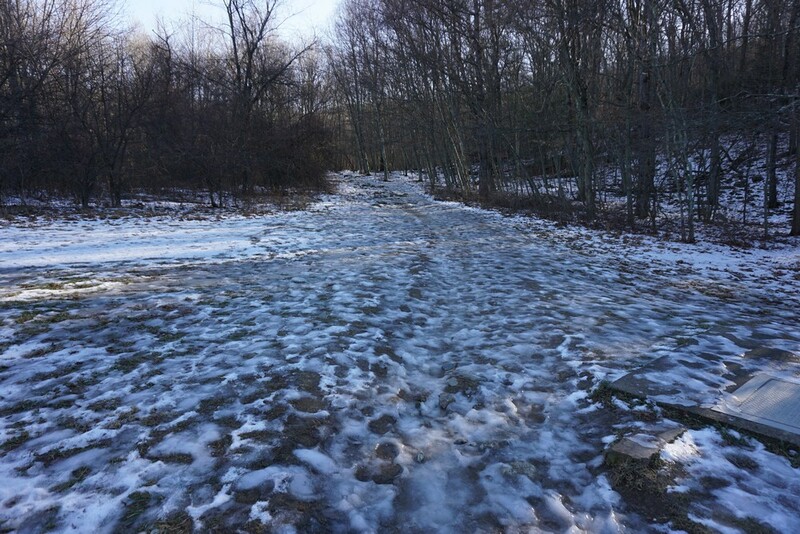 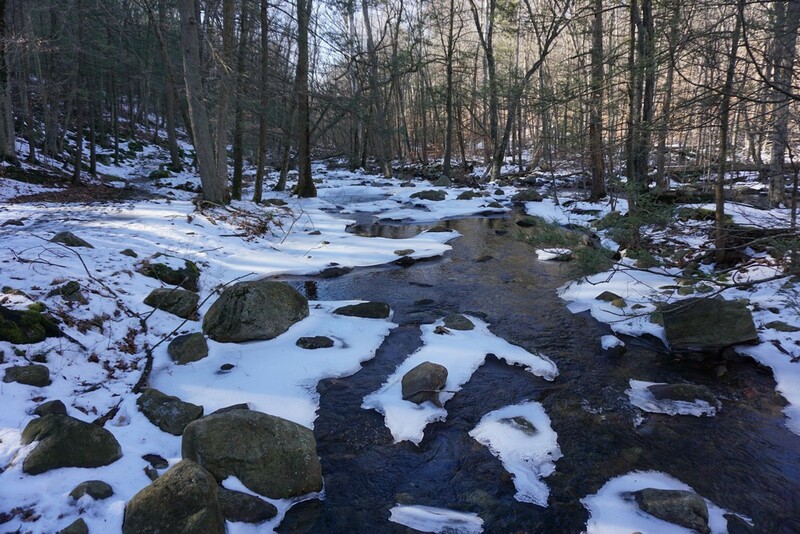 While most of the snow had already melted, the deeper valleys still had snow, and many of the trails were icy. 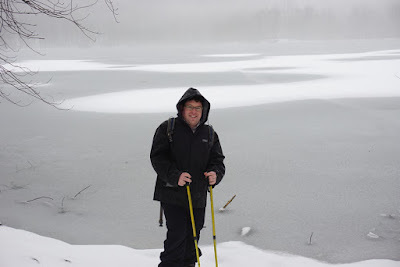 I had brought my footgear with cleats which really made the difference hiking on the ice. 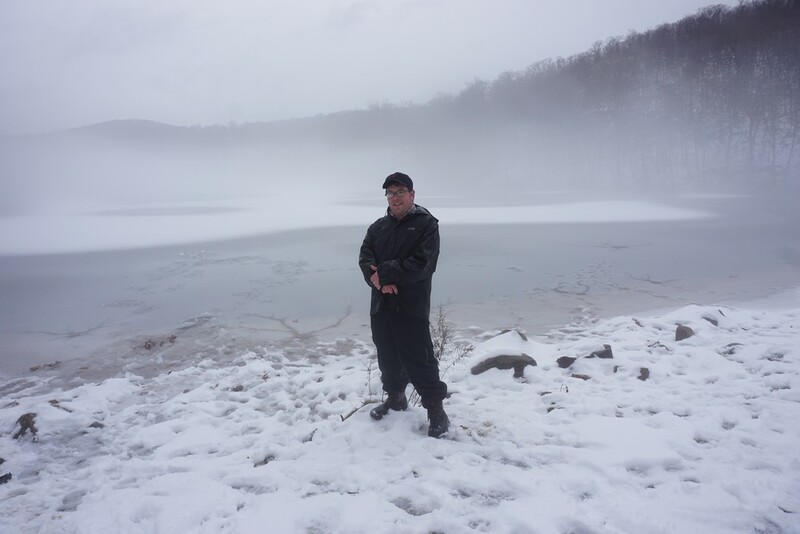 It was a very cold day, and I had to dress in many layers. I parked at the trailhead, which was very empty for a Sunday. 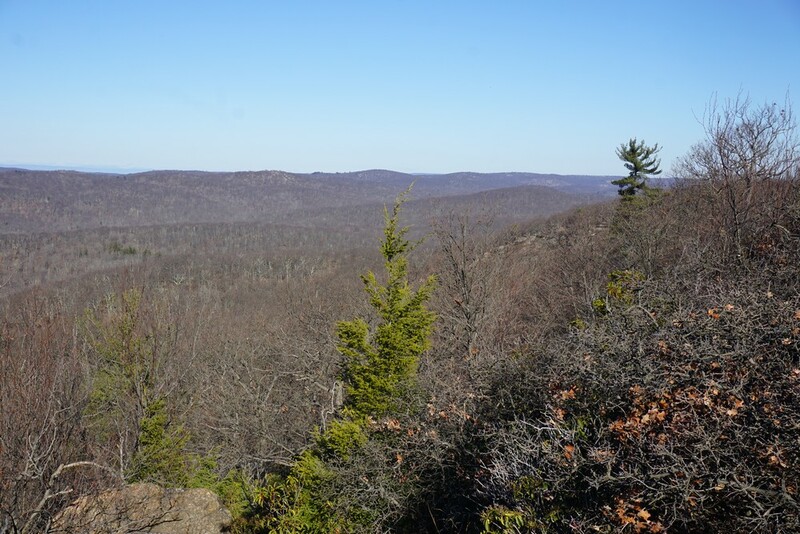 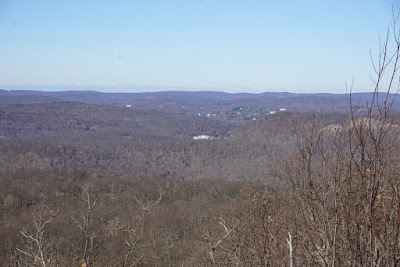 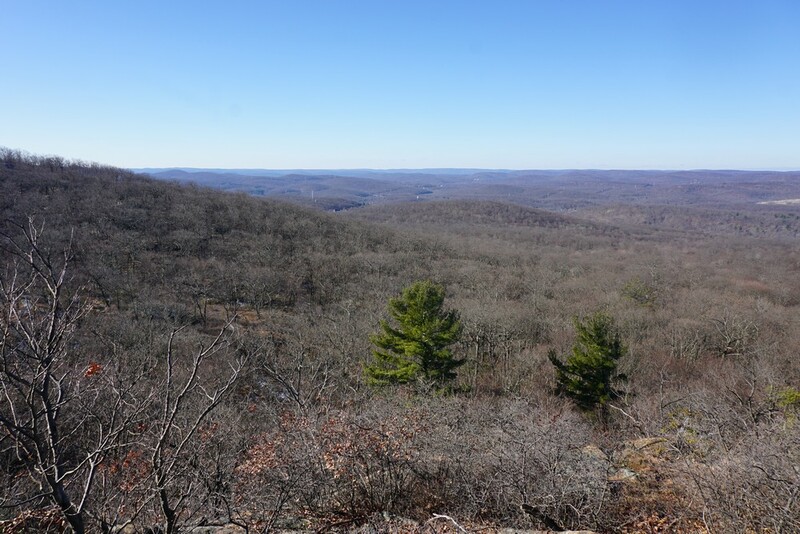 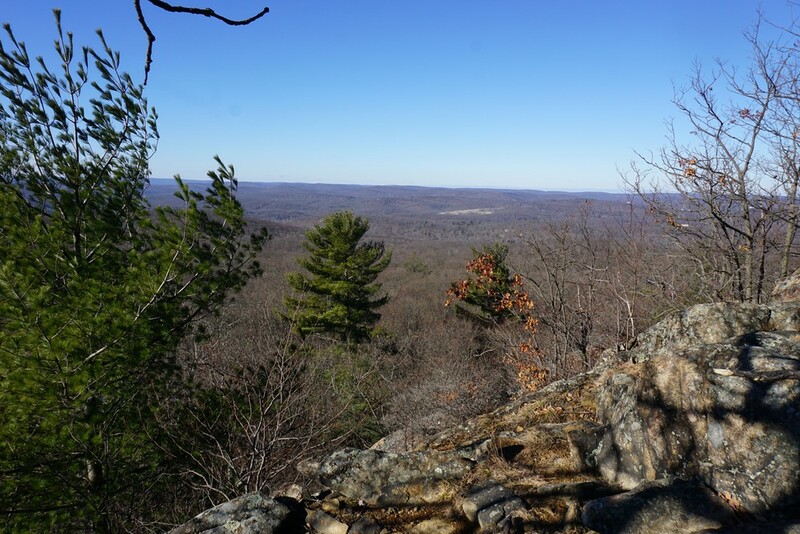 I took the Reeves Brook Trail up to its intersection with the Seven Hills Trail, and took the steep scramble up the cliff here to the North Hill view. I then continued past the gas line, and up to the Chipmunk Mountain summit. 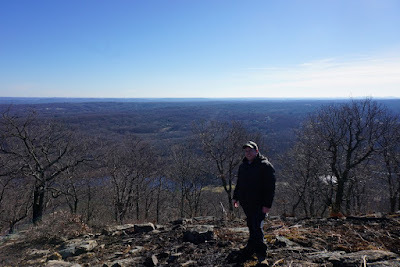 I descended on the HTS Trail, and then took the Pine Meadow Trail to the Connector Trail to the Stony Brook Trail, and then back to the Pine Meadow Trail to the parking area. 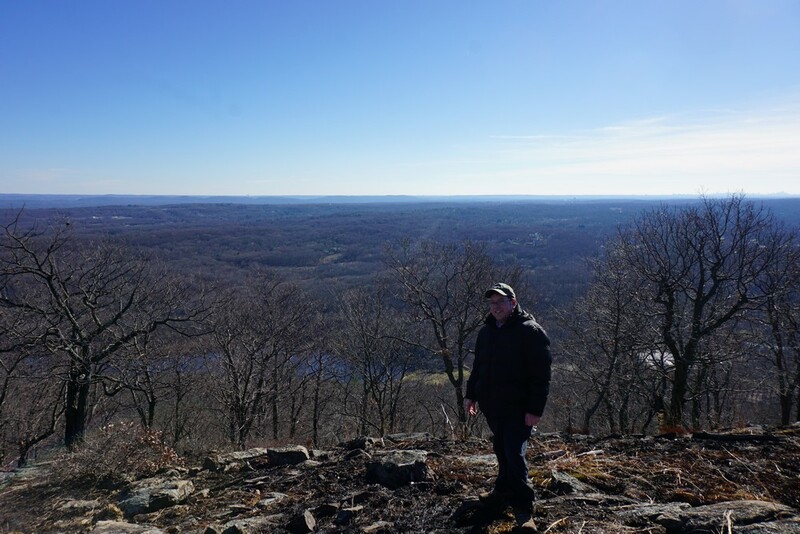 I had met some friends for a group training in the NY/NJ Trail Conference Headquarters in Mahwah, and we had planned a hike afterward. The problem was that the weather was awful. 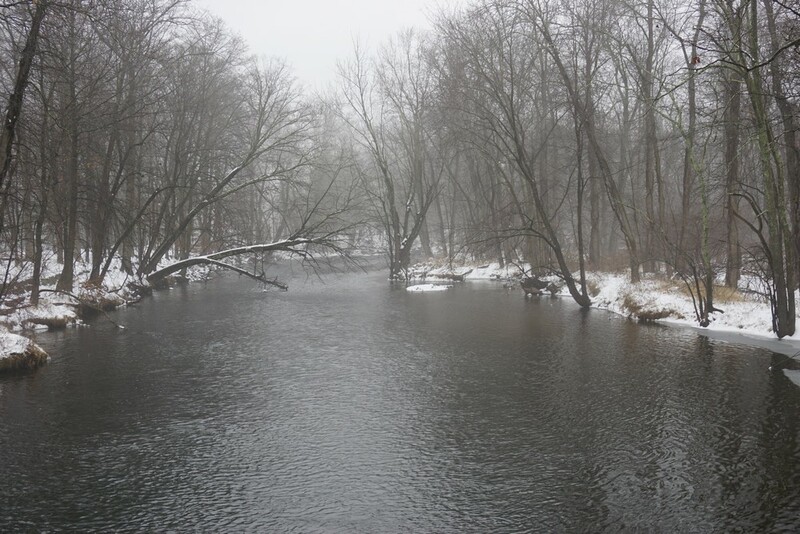 There was a snowstorm the previous day on Saturday, and we received about five inches of snow. 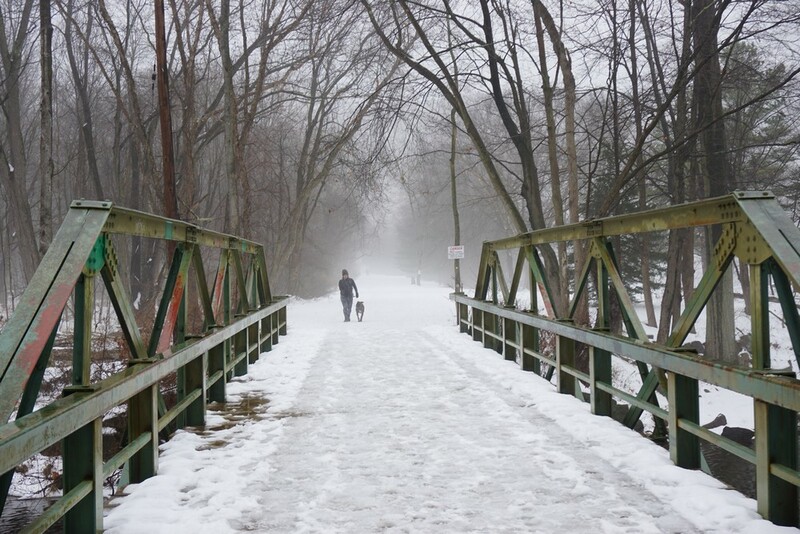 On Sunday, the snow had changed over to rain, but it was a cold damp rain with the snow melting slightly, causing a thick fog over everything. 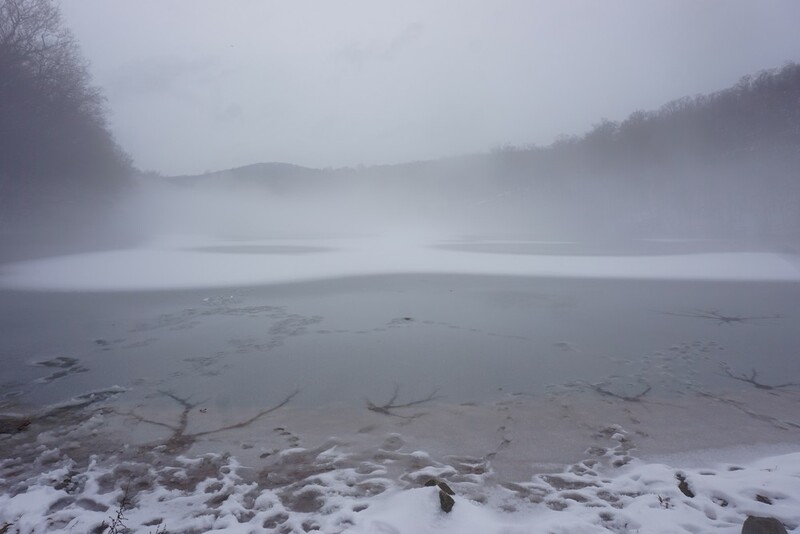 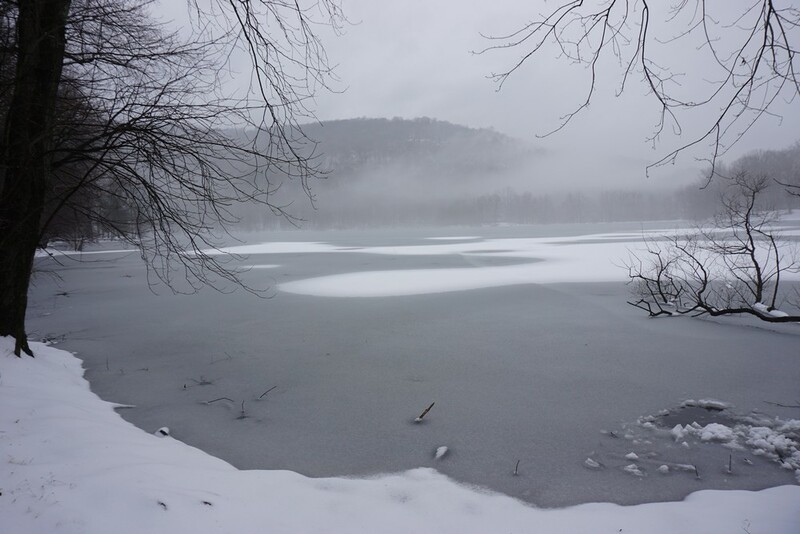 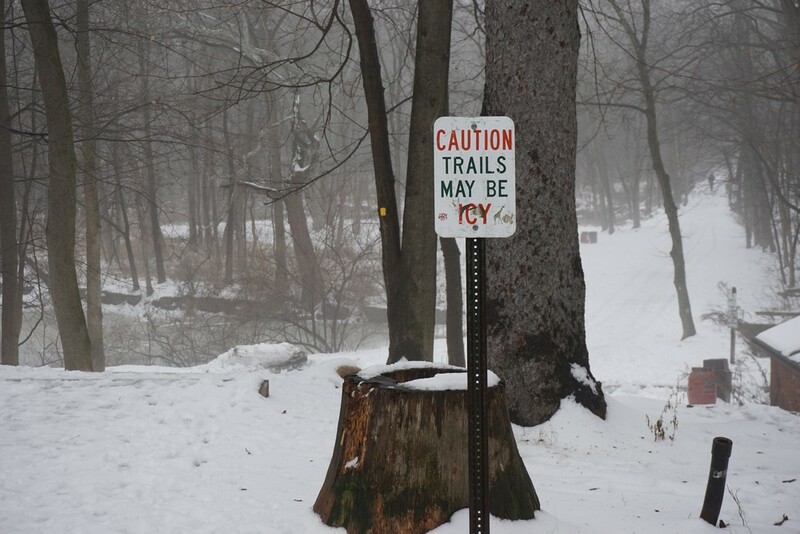 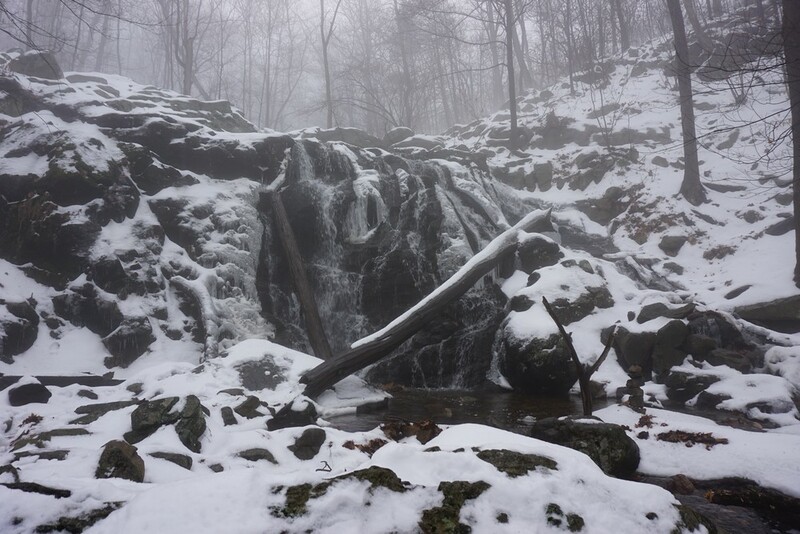 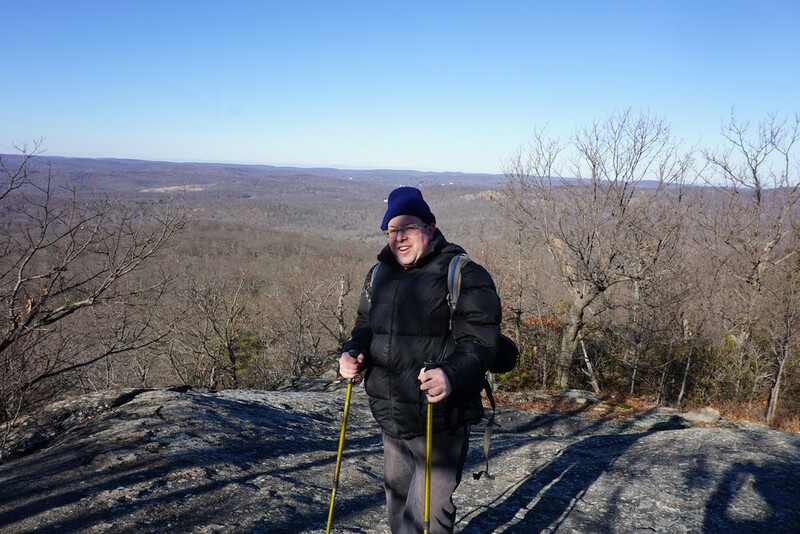 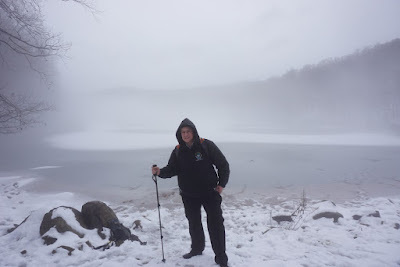 Due to the condition, with an active cold rain in snowy terrain with thick fog, we decided to limit the length of the hike to a short one right nearby in Ramapo Reservation. 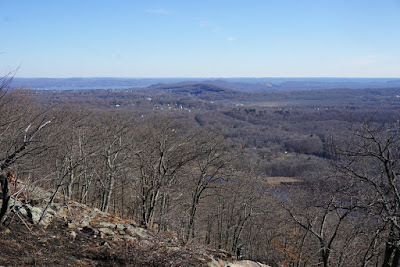 We parked in the parking area, crossed over the Mahwah River, and took the River Trail to its end at the new Vista Loop Trail. We then veered off to the waterfall, went back on the Vista Loop Trail, and then at MacMillan Reservoir cross over the dam to the other side at the Reservoir Trail. 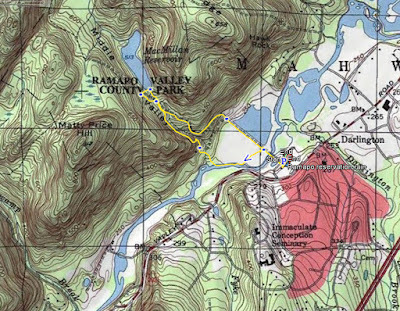 We took the Reservoir Trail down to the end shortly after the dam, and took the newly renamed Ridge Loop down back to the Vista Loop at Scarlet Oak Pond and then back to our cars. 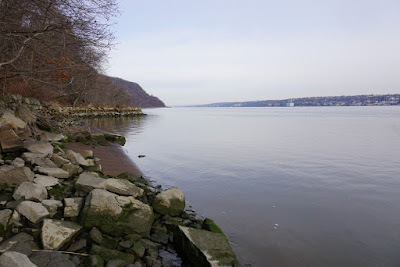 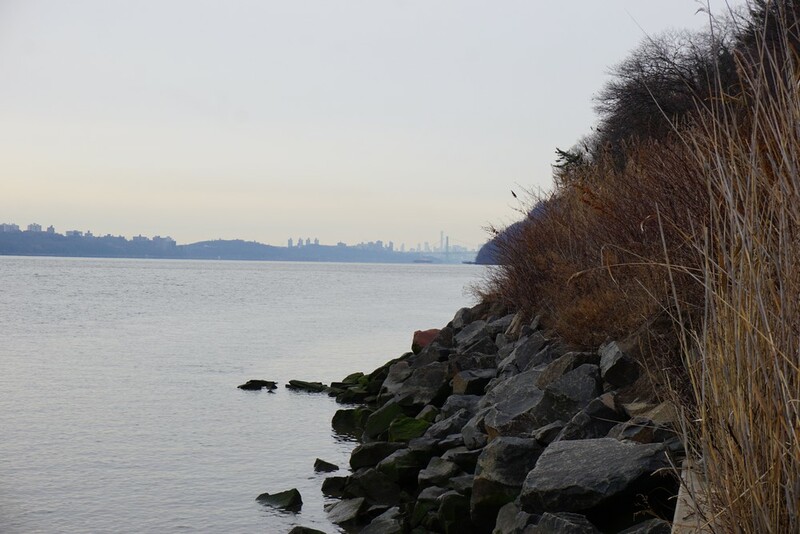 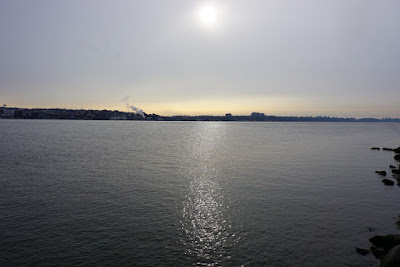 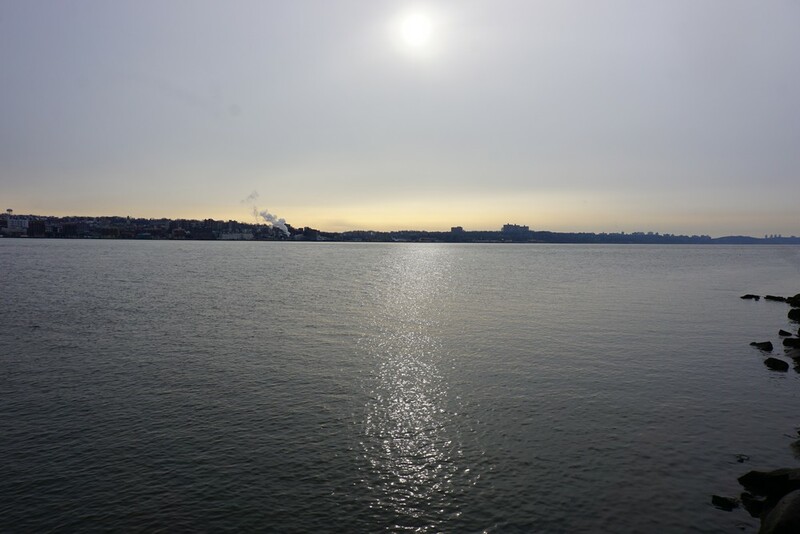 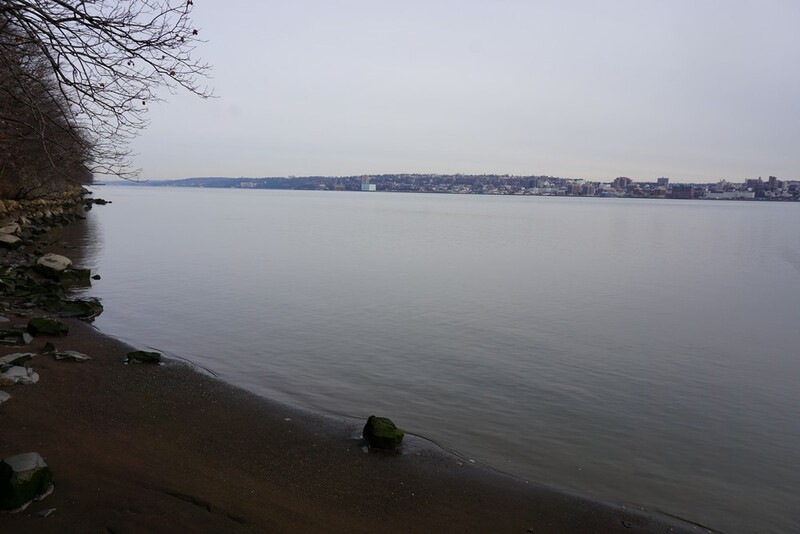 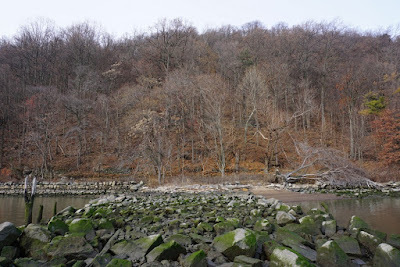 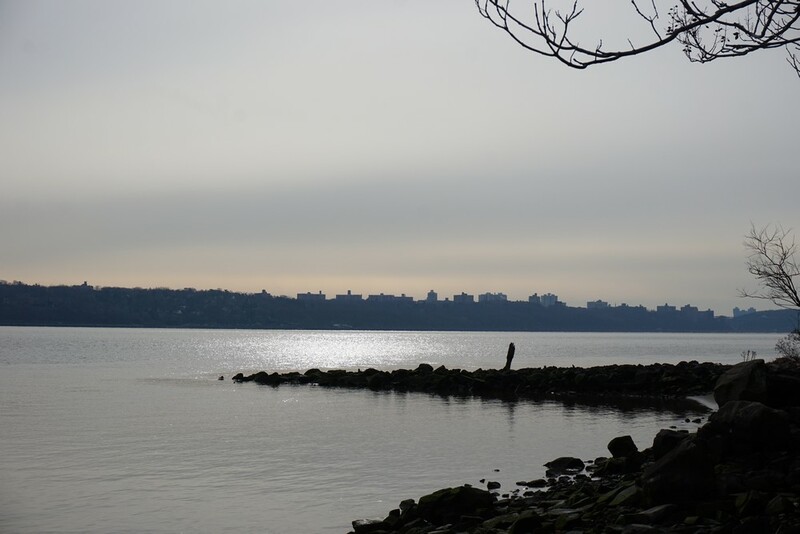 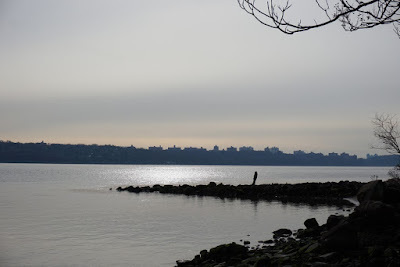 I had been to the Palisades a few weeks prior, and decided to continue doing some additional stretches of the Long Path and Shore Trail that I had not yet done. 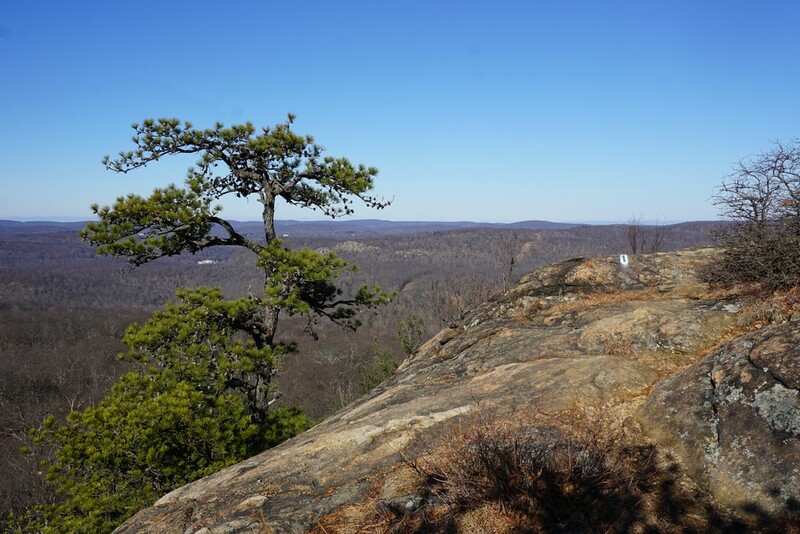 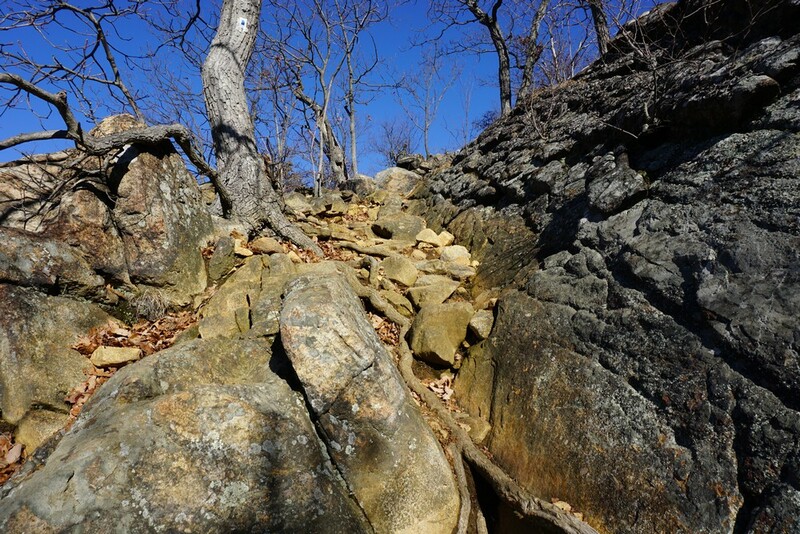 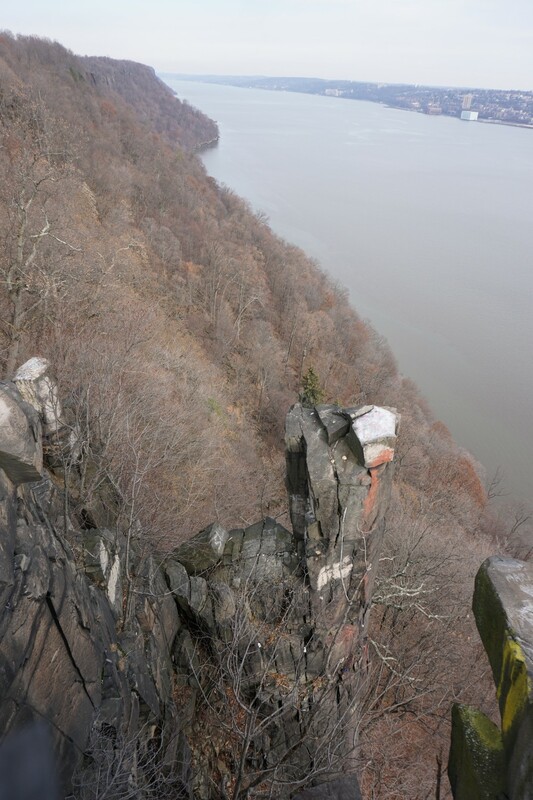 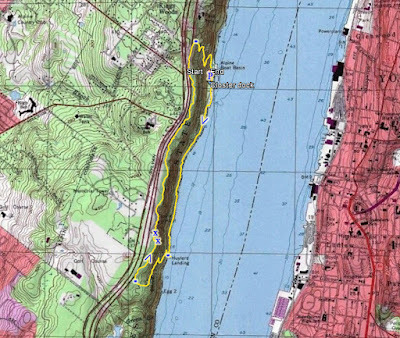 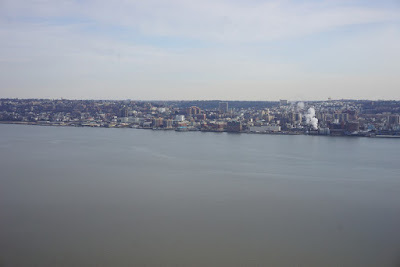 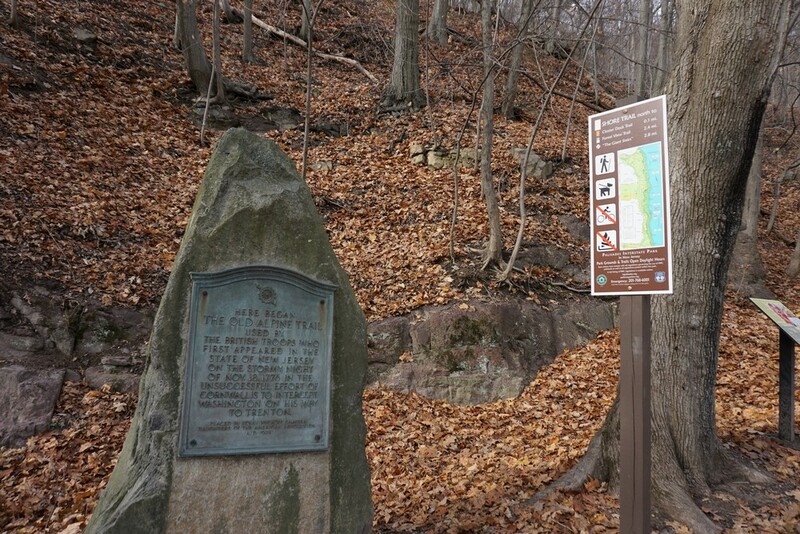 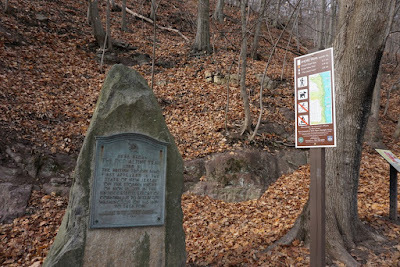 The area features dramatic diabase cliffs along the side of the Hudson River, with a pleasant walk alongside the river on the bottom, and nice views above the cliffs on top. 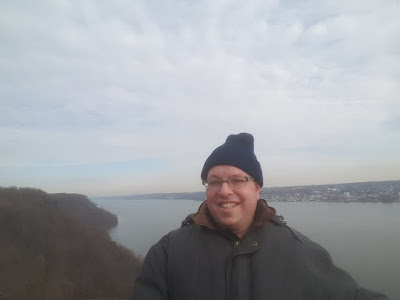 It was a cold December day, and I needed full winter gear. 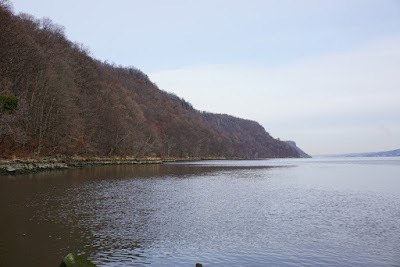 I parked at the Alpine Boat Basin down at the bottom of the Palisades, and went on the Shore Path southward along the side of the river towards Huylers Landing. 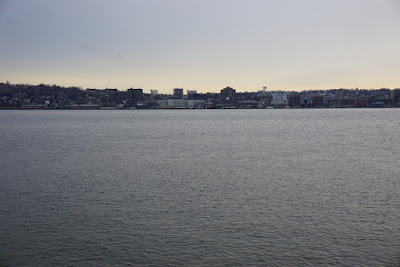 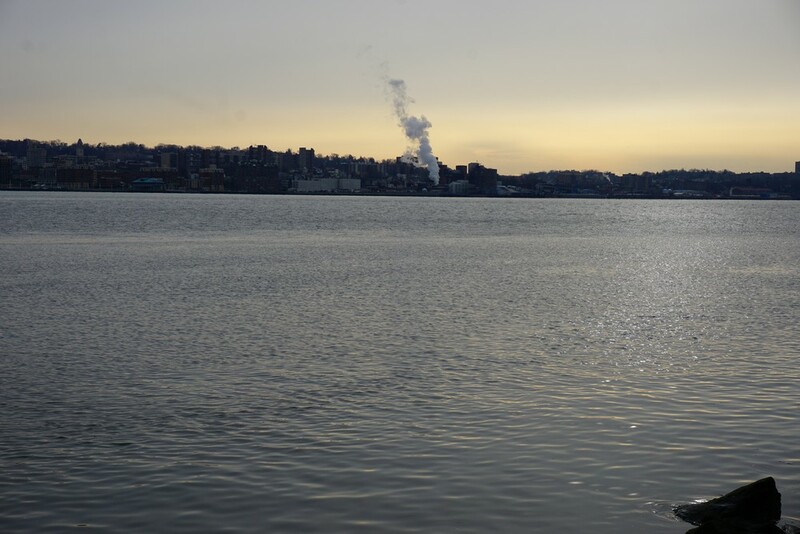 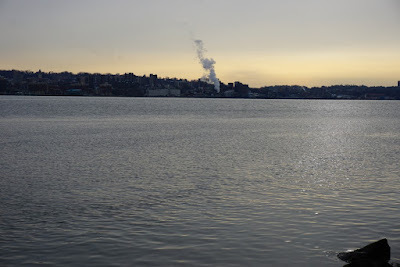 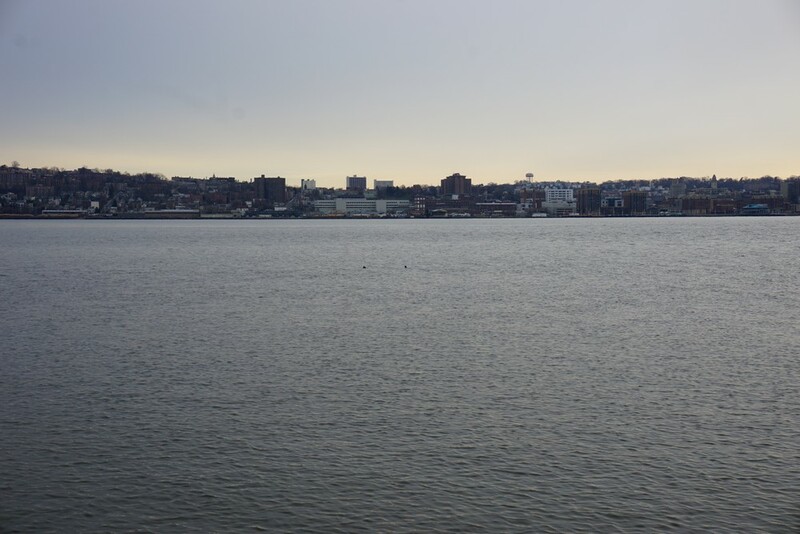 Across the river was an urban view of the waterfront and downtown of Yonkers, population roughly 200,000. At Huylers Landing, I went on the old jetty that goes into the river to get some better views, and then took the Huylers Landing Trail up the cliffs. The trail is steep, but is relatively easy and not quite as strenuous as I thought it would be. 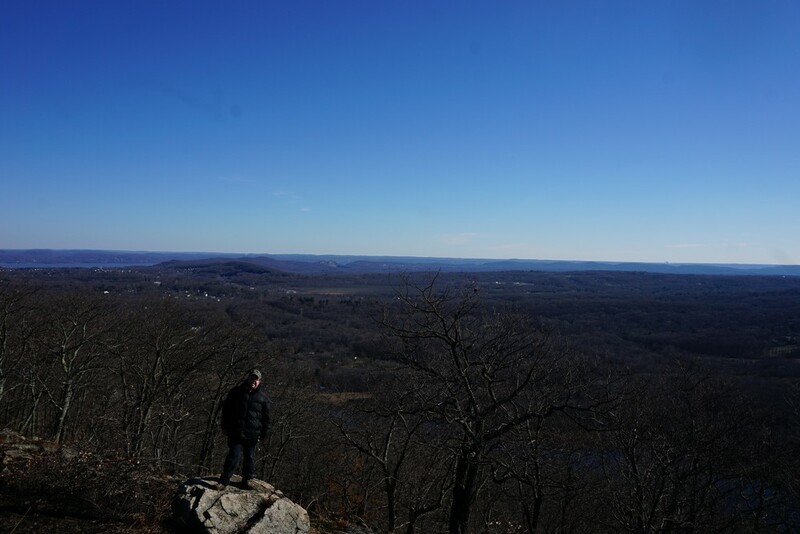 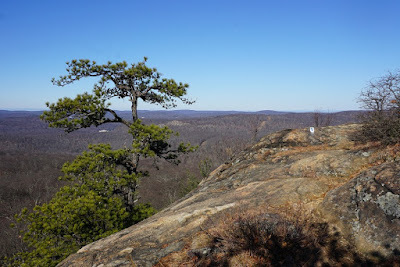 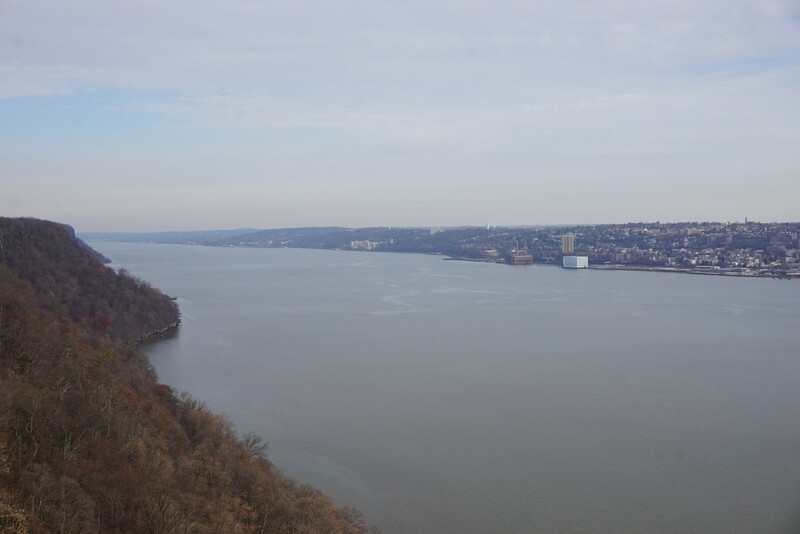 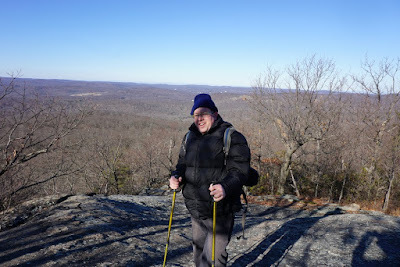 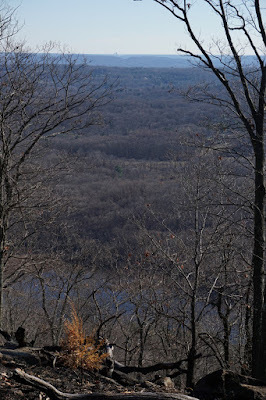 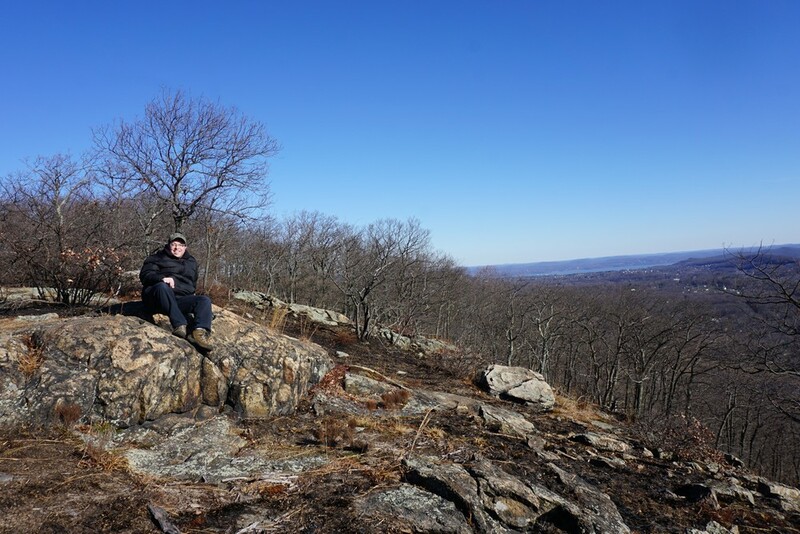 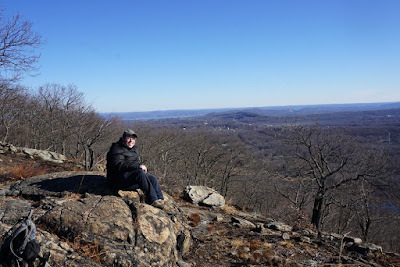 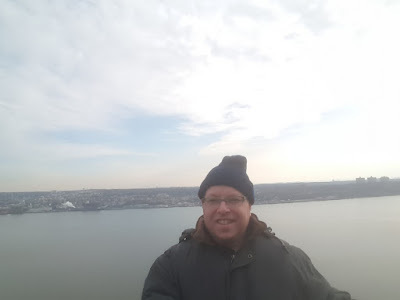 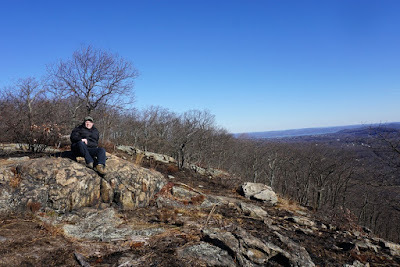 At the top of the Huylers Landing Trail, I took the Long Path north parallel to the Palisades Parkway. 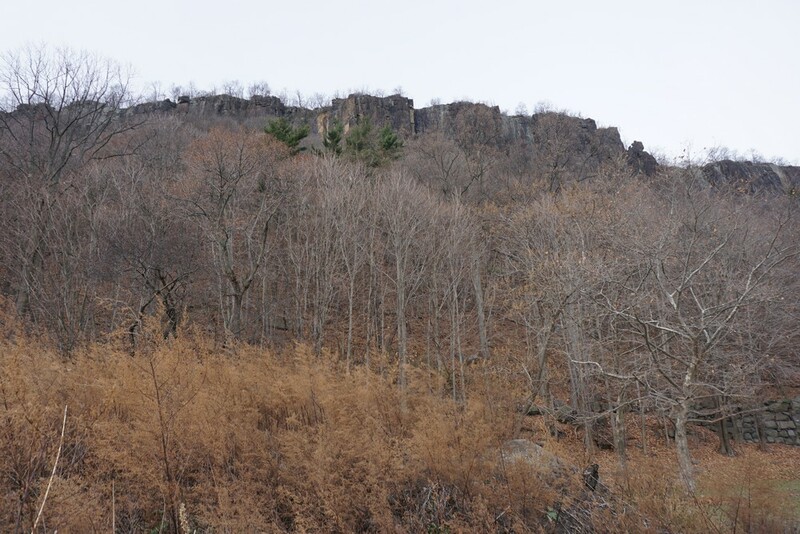 This part of the hike is very loud from the constant cars in proximity on the highway. 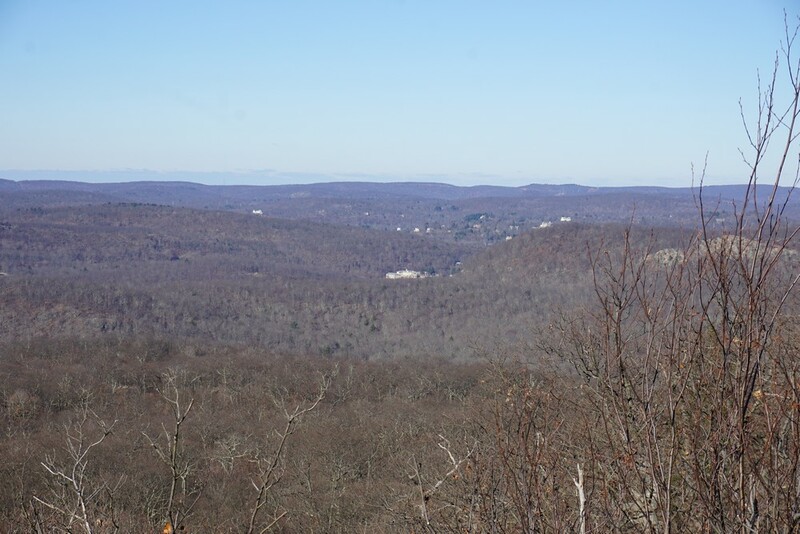 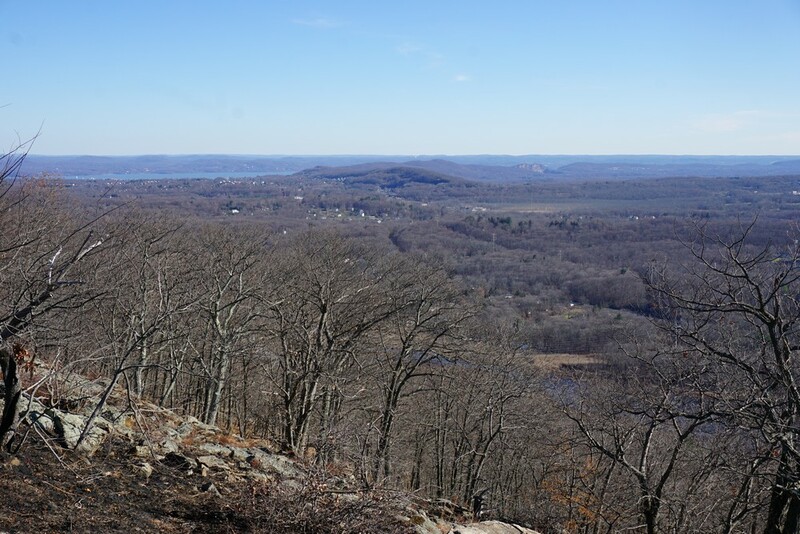 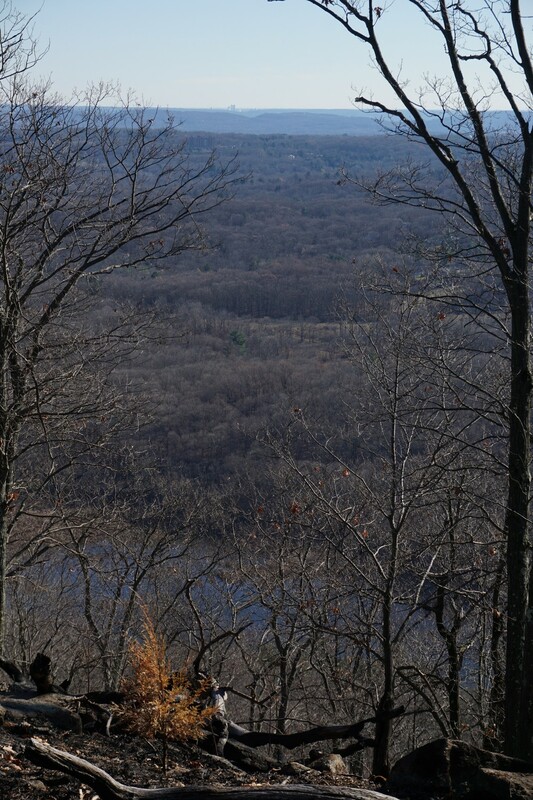 The trail goes to the Alpine Lookout, which also affords excellent views from the top of the cliff towards Yonkers. Approaching the Alpine lookout, there is a smaller lookout right off the trail extending over a columnar rock face in the cliff (surrounded by a fence) with a very good view of the structure of the cliffs. 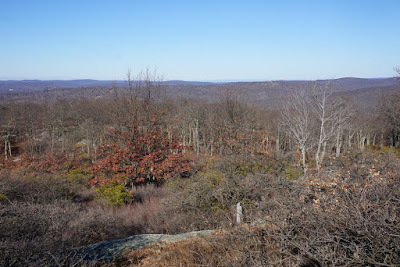 I continued along the Long Path, past the Alpine view, past an old stone ruin, and then eventually to the Closter Dock Trail. 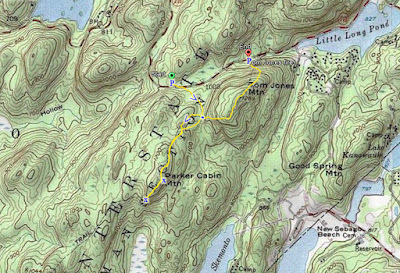 I took the Closter Dock Trail down the mountain, to the Shore Trail right before the Alpine Boat Basin and then back towards my car. 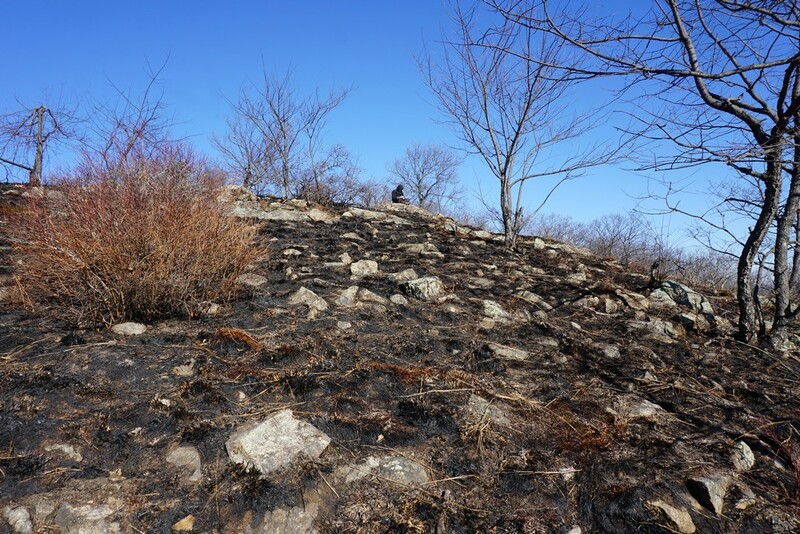 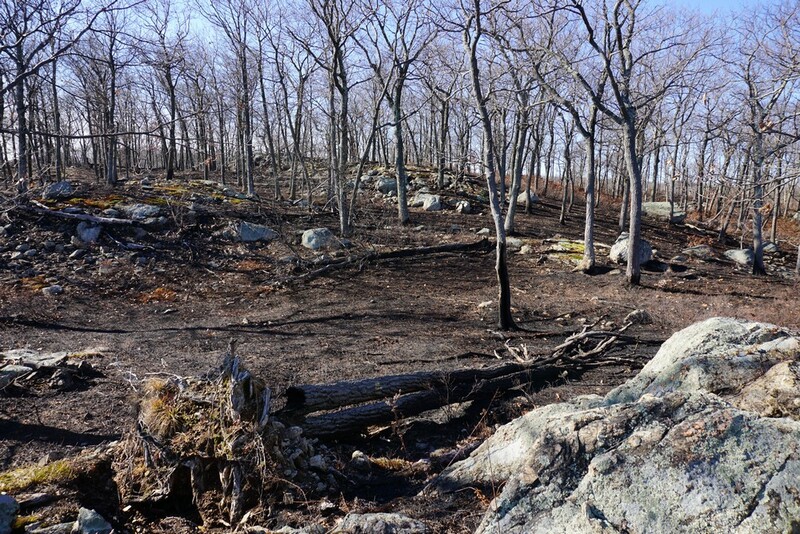 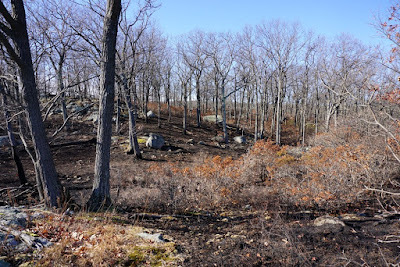 We had not yet had a chance to explore the brush fire at the Panther Mountain area. We had seen this fire burning with some very large blazes back in November, and wanted to check out the area. 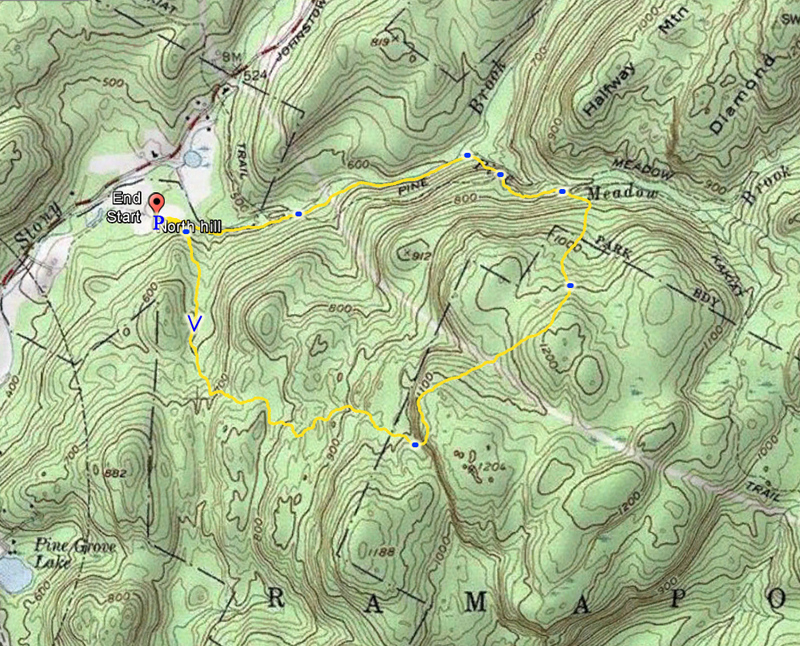 We parked at the Diltzes Road parking area, at the TMI trailhead. 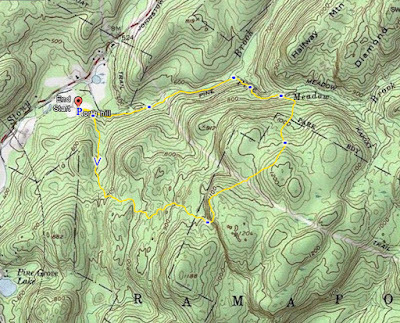 At the power lines, instead of continuing along the trail, we veered off southwest instead to the unmarked trail (on the maps) that climbs up Panther Mountain. 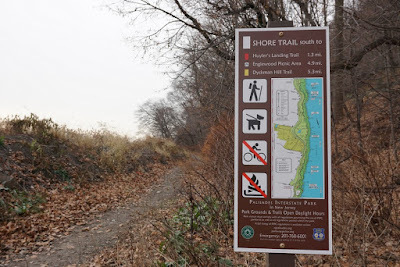 The trail is somewhat overgrown and not maintained, but is very accessible. 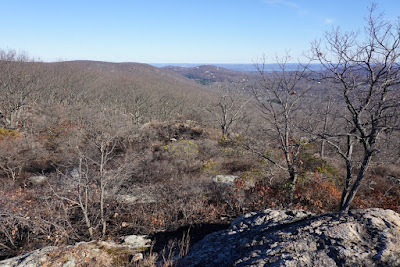 We took this trail all the way up to where it meets the S-BM Trail. Exactly at this point is where the burned zoned begins. It seems the burned area only started at the top of the mountain area, and didn't affect the steep slope below it. 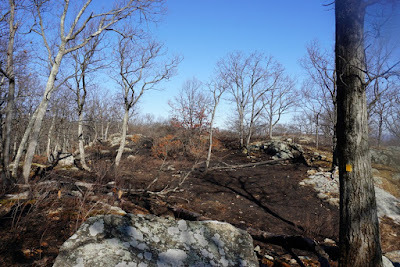 We headed south on the S-BM Trail, and this area was indeed very burnt. I went to both views, and right before the descent of the trail into the notch, turned around back on the S-BM, and then continued along this trail all the way to the intersection of the TMI Trail. 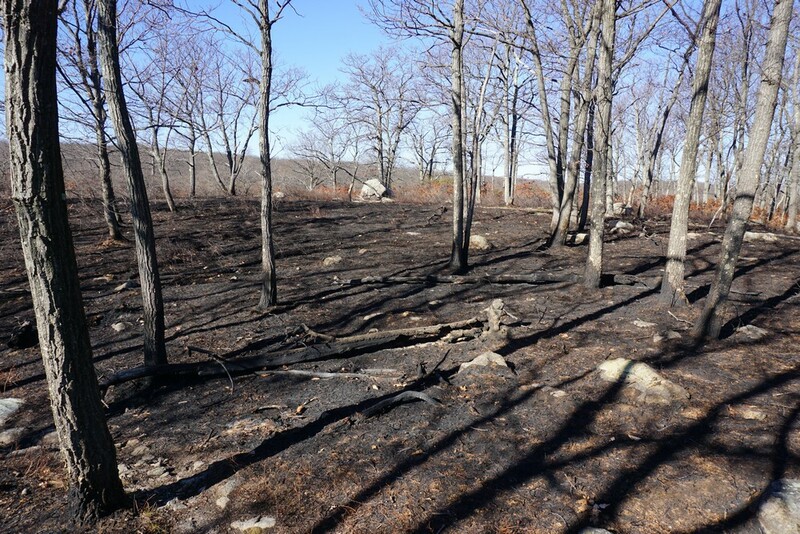 This entire area was also extensively burnt, with many pockets and zones of burnt areas. The burn zone extended to the stream just prior to the TMI Trail intersection. 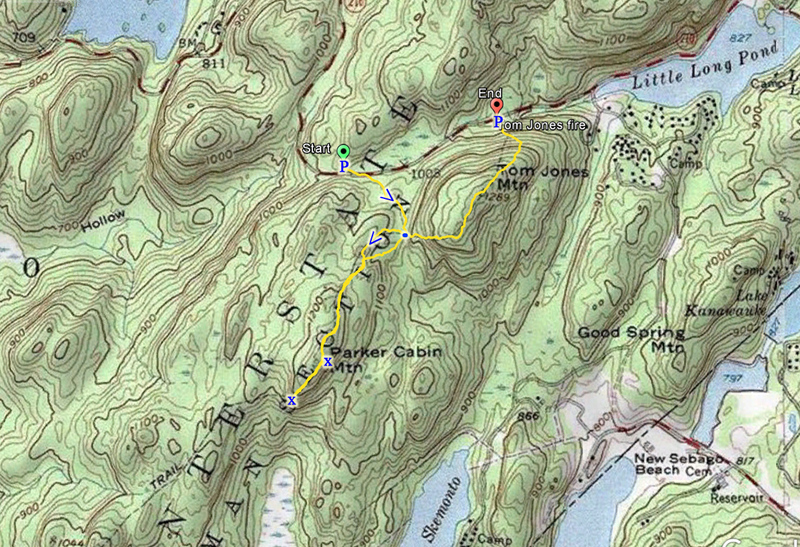 We took the TMI Trail the rest of the route, descending down the mountain, back to the power line area, and then back to our car.